These Mexican Chocolate cookies are funfetti done naturally. 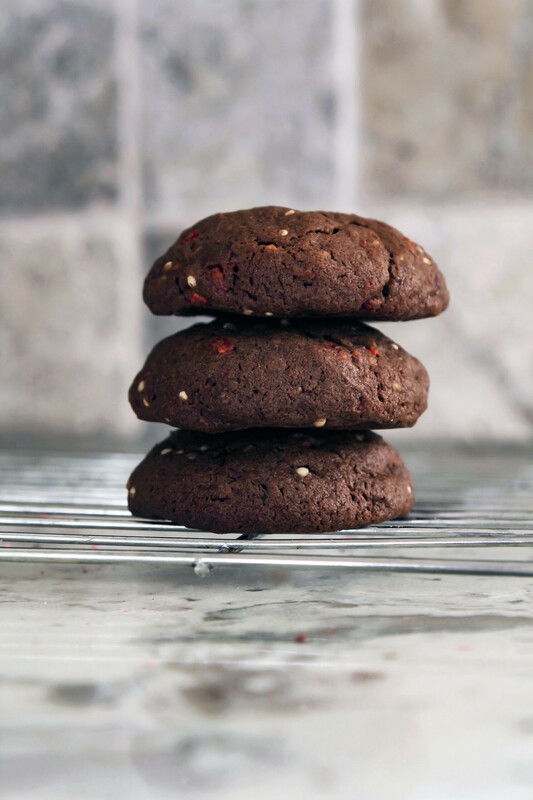 Made with delectable Mexican chocolate for deep flavor, freeze dried raspberries for color and a sweet-tart addition, and millet for crunch and a nod to sprinkles; you’re going to love these. We’re kicking off wedding season this weekend (right?) and it almost feels unbelievable that we’re already back to this love-filled, travel-packed, expensive season. I won’t lie, I do love weddings, what they stand for, and the incredible creativity and diversity each one requires. Oh, and the wine, can’t forget the wine. But had you told me five years ago that my summer weekends would be filled with road trips, an abundance of white wrapping paper, and hotel bills, well I would have told you that I didn’t care. Because back then, there could never be too many weddings. The difference now — I just want a lazy weekend at home with nothing to do but lay in my backyard (if I had one — soon! More on that some other time). I live for summer. Everything about it, from the long days, to the hot hot weather, and of course, our annual family vacation to “the lake”. It’s my life, my favorite place on earth, and truly the only place I feel content. I just hope by the time that rolls around I’m not sick of being in the car. I better buck up, because it’s a solid 8 hour drive with no stops. And inevitably we’ll stop more than planned. Anyway, I’m daydreaming about summer when it feels like spring has yet to show up to the party. Long story short, we have a wedding this weekend and I need an extra savings account just to get me through the season. Anyone else feel the pain? If nothing else, bring a batch of these cookies along and you’ll be crowned Road Trip Queen. ; one bite and I never turned back. Mexican chocolate has a delightful grittiness that’s hard to explain unless you’ve had it, so don’t let my lack-for-a-better-word turn you away. It’s deep, full-bodied, and often comes in a variety of flavors; vanilla, chile, cinnamon, coffee, etc. I love it as a snack but it’s also great in cookies (like these cuties), Mexican hot chocolate, mole, or chopped up and sprinkled over ice cream. They’re easy, perfectly sweetened, and great for any bridal shower, baby shower, or backyard get-together you’ll have this spring and summer. These chocolate-chocolate cookies are funfetti done naturally. Made with delectable Mexican chocolate for deep flavor, freeze dried raspberries for color and a sweet-tart addition, and millet for crunch and a nod to sprinkles; you’re going to love these. Heat oven to 350°F with rack set in middle position. Line baking sheets with parchment paper. Whisk together flour, cocoa powder, salt, baking soda, and baking powder in a medium bowl; set aside. In the bowl of a stand mixer fitted with the paddle attachment, cream butter, granulated sugar, and brown sugar at medium-high speed until light and fluffy; scraping down sides of the bowl as needed. Add eggs and vanilla and beat at medium speed until combined. Add half of the flour mixture to mixer and beat at low until nearly combined, add remaining flour mixture and mix until just combined. Add raspberries, chocolate, and millet to mixer and mix just to combine. Working with a tablespoon of dough at a time, roll into balls. Space dough balls 2 inches apart on prepared sheets. Bake 1 sheet at a time until cookies are puffy and edges are just set; 10-11 minutes, rotating sheet halfway through baking. Let cookies cool on baking sheet 5 minutes; transfer to wire rack to cool completely. This post contains affiliate links, thanks for supporting all things ZK! It’s such a fun and exciting time, but can definitely cost! 🙂 Thanks Kelli!